Lamberts Florisene is a vitamin supplement for women that is high in iron and in particular, Ferritin. Chronic Telogen Effluvium (CTE) is the term given to chronic increased hair shedding often caused by low blood stores of Ferritin. 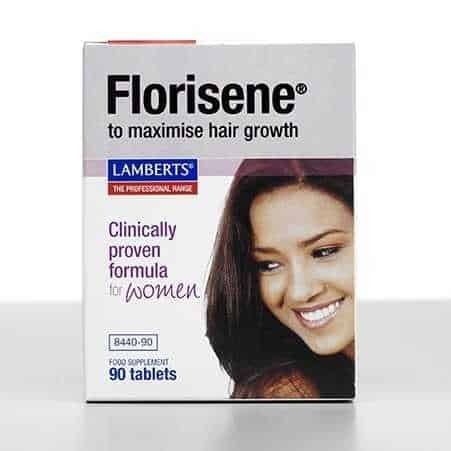 Lamberts Florisene has an added amino acid to trigger hair re-growth, thereby increasing hair volume and reducing hair loss. Florisene® is a clinically supported supplementation programme shown to help women with Chronic Telogen Effluvium (CTE), the term used to describe excessive, persistent, but reversible hair shedding. CTE affects up to 4.8 million women in the UK and Florisene® is a cost-effective answer for anyone with this problem. Research involving hundreds of women has shown that the major cause of CTE is low serum ferritin. This reflects the amount of ‘stored’ iron in the body. For some women, low ferritin levels results in gradual hair loss. Low serum ferritin is caused by reduced red meat consumption and menstrual blood loss in women of reproductive age. The good news is that research has shown that if the serum ferritin is raised above a certain point then normal hair growth re-establishes.